This baked ziti recipe is a classic Italian dinner, perfect for a family or friend gathering. In Italian it’s called Pasta al forno for a reason: you cook your pasta, prepare you sauce, add cheese and then bake everything in the oven to get the perfect golden brown crust. Rich and very tasty, there’s not just one authentic Italian baked ziti recipe! In fact, like all traditional recipes, the recipe is handed down in the family and for this reason every family has its own version that over the years is perfected and enters by right in the recipe book to be transmitted to posterity. All the recipes have one thing in common: the pasta is first cooked in boiling salted water, then seasoned with tomato sauce or ragù, mozzarella and homemade béchamel and finally baked in the oven, after having been sprinkled with Parmesan. Baking in the oven allows the various ingredients to blend well, giving life to a tasty and stringy dish, golden on the surface and delicious. The basic recipe is prepared with tomato sauce or a proper Italian ragù but there are many variations without sauce, without meat and so on. Let’s be honest: this baked ziti recipe is designed to be customised to the maximum and, why not, to be made by using those ingredients that we have in the fridge and we want to recycle. Just think about it: also the mac and cheese can be seen as a variation of this baked ziti recipe, without forgetting my (extremely) loved Italian pasta au gratin. And, if you want to think big, a classic Italian lasagna is also a type of baked pasta. One of the reasons why baked pasta is so much loved in Italy and everywhere is simple: baked ziti can be prepared in advance and put in the refrigerator before being then (re) baked in the oven, or it can also be frozen and pulled out as needed. Not only that, because with the passing of the days (up to 3, stored in the refrigerator) it becomes even better and tastier. 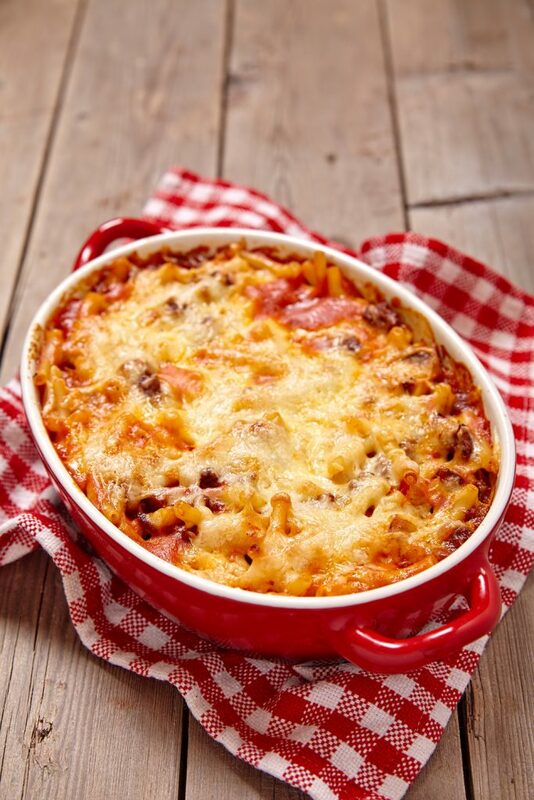 The following baked ziti recipe is the basic one, traditional and from my family; if you dare, prepare the Neapolitan-style baked pasta, seasoning the pasta with fried meatballs, scamorza, Neapolitan salami, tomato sauce and grated Parmesan. 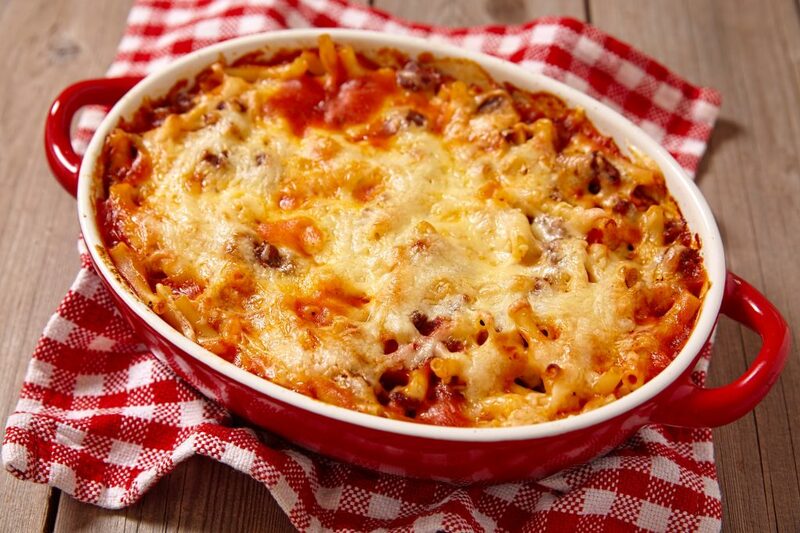 Enjoy the best baked ziti recipe, from Italy with love! Once the sauce is ready, put the pasta to cook and in the meantime turn the oven to 200°C. Cut the mozzarella into cubes or slices. Drain the pasta al dente and put it in a large bowl, then season it with the sauce and the mozzarella (leaving little of both aside) and mix. Also add the béchamel sauce leaving little aside. Remove from the oven, let it set for about 3 minutes and serve. For your tomato sauce, you can use fresh tomatoes or passata. Passata is an uncooked tomato purée strained of seeds and skins. Never use a tomato sauce or a tomato paste for your sauce, ’cause they’re already cooked and your sauce won’t taste so good. If you cannot find tomato passata, the best substitution is tomato purée or, even better, use plain canned tomatoes and run them through a sieve or a food mill top get the same exact result. To make this pasta al forno you should always use short pasta (ziti, rigatoni, penne, etc) but you can opt for tagliatelle: once cut, the pasta will be full bodied and the result at the table will be pleasant.